Already have a Gift Certificate? Lucky you!Enter your gift/adventure certificate number in the box below. Q: How long are Gift Certificates valid for? All Adrenaline Gift Certificates are valid for 5 years from the date of purchase. Q: Can I use my Gift Certificate for another experience? Absolutely, Adrenaline Gift Certificates are fully flexible. To redeem your Certificate for another experience you just need to click "Book Now" on your chosen experience, then enter your Certificate number at the checkout. If it costs more than your Certificate credit, you can top up using a credit card or PayPal. Q: Why is my Gift Certificate not working online? You may need to check that you are entering the full Gift Certificate number, including the hyphens. Q: How do I redeem multiple Gift Certificates? Enter your first Gift Certificate number in the "Use Your Certificate" section of the website. Then proceed with your booking (adding more participants if required). Finally, at checkout, enter in your other Certificate numbers to complete your order. Q: Can I have a refund on my Gift Certificate? 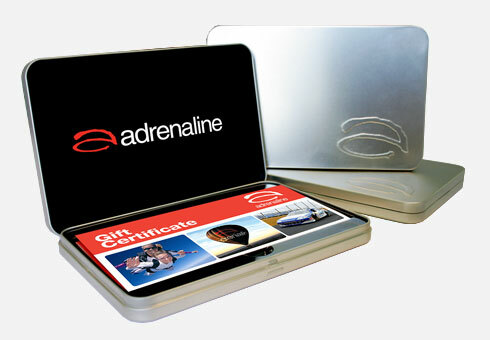 Adrenaline Gift Certificates are non-refundable, however they are fully flexible. This means you can redeem your Certificate towards another experience offered on the Adrenaline website or alternatively transfer the Certificate to someone else. Q: How do I change the name of my Gift Certificate? To change the name on the Certificate you will just need to complete a Transfer of Certificate form. Please call us on 1-888-992-3736 to have this form emailed to you. Q: My Gift Certificate has already been paid for, why is it asking me to pay again? You do not have to pay anything further when redeeming your Certificate, the booking price showing will be covered by your Certificate. Q: I redeemed my Gift Certificate but I do not know where to go. Q: How do I redeem my Gift Certificate and add more people? Enter your first Certificate number in the "Use Your Certificate" section of the website. You can then add extra participants in the booking page. You can pay for extra participants using a credit card or PayPal at checkout. Q: I redeemed a Gift Certificate and bought a second ticket but it charged me the full amount. The amount shown is the total for the whole booking; it does not provide a breakdown of payments. When the booking is confirmed, the Certificate is redeemed in full and it is only the difference that is charged to the card. Q: How do I extend the validity of my Gift Certificate? Need more time? You can extend the credit on your Certificate for a fee of $30, just contact us before the expiry date to arrange this. Did you know you can attend an experience AFTER the expiry date? Simply make a booking before your Certificate expires and you can attend after the expiry date.